Originating in South America, the tomato has the distinction of being one of North America’s favorite garden vegetables. Tomato plants can be either determinate or indeterminate. 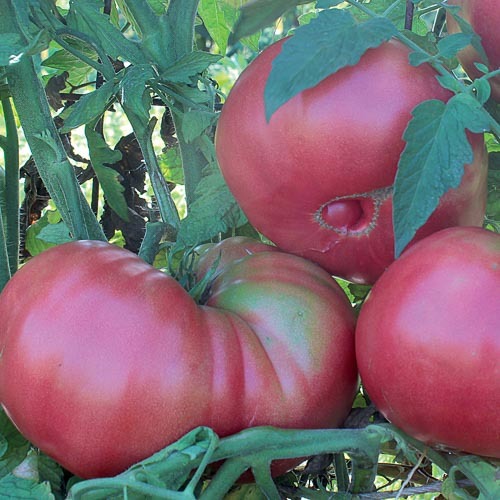 Determinate plants will produce tomatoes that all ripen around the same time, while indeterminate plants will continue producing new growth and new fruits throughout the growing season. 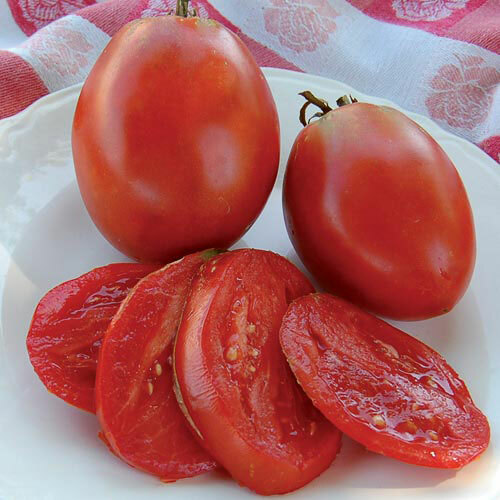 Tomatoes also come in hundreds of varieties, from large, ribbed “beefsteak” types to small “cherry” and “pear-shaped” tomatoes in a range of colors. Tomato plants are regularly started indoors from 4-6 weeks before the last spring frost and transplanted outdoors when soils have warmed. Plant tomato seeds ¼ inch deep into small containers of potting soil, making sure to keep soil moist. Transplant tray-grown seedlings into 3-inch pots when two to three leaves have formed, keeping plants in a light, well-ventilated location. Transplant tomato seedlings outdoors in a sunny spot as soon as the soil has warmed and after all danger of frost has passed. Gradually harden off –introduce the seedlings to the direct sunlight, dry air, and cold nights—and plant outside when there is no danger of frost and air temperatures are at least 45 degrees F, with soil temperatures at a minimum of 50 degrees F.
Seeds will germinate in 7-14 days when started indoors. Most varieties require ample space to grow, so space your plants 24–48 inches apart in rows at least 36 inches apart. Both indeterminate and determinate tomato varieties typically require trellising, staking, or caging to keep the tomato vines off the ground, where they are more susceptible to disease. Be sure to keep them moist but not waterlogged; erratic watering causes the fruit to split and encourages blossom end rot. Tomato plants are susceptible to early blight, blossom end rot, late blight, tomato mosaic virus, and many other diseases. Rotating crops, removing diseased plants, and staking or caging plants can help prevent these diseases or curb their spreading, as can mulching the base of the plants. 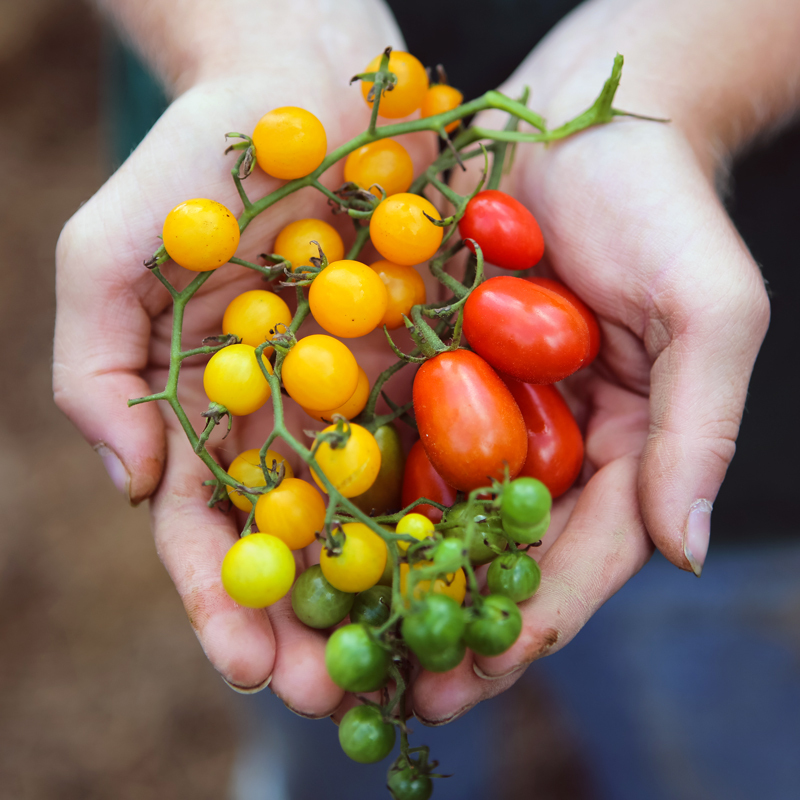 Harvest tomatoes when they are firm to the touch but seem to give a little. Ripe fruits will pull easily from the vine. Ripening takes about 7-8 weeks from planting for determinate (or “bush”) types and about 10-12 weeks for indeterminate varieties. 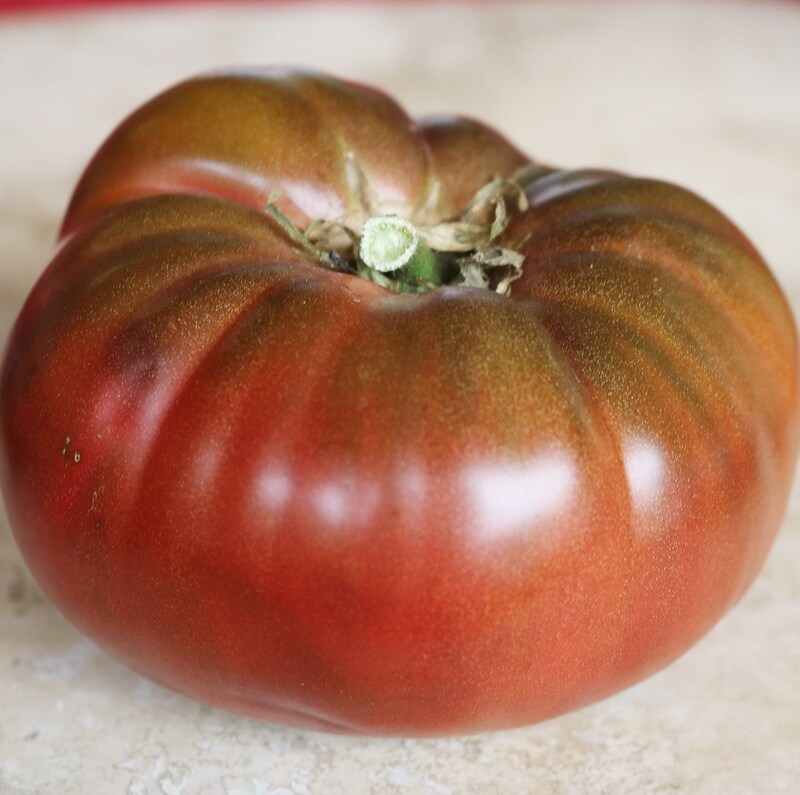 Enjoy tomatoes at peak ripeness sliced into a BLT or mixed together into fresh salsa. In salads, tomatoes are particularly good with mozzarella, basil, olive oil, and seasonings. If you are lucky to have a bumper crop of tomatoes, try making your own tomato soup, tomato paste, or homemade pasta sauce. Blanched and cored whole tomatoes can also be frozen or canned. Fried green tomatoes, typically made in the Southern United States, consist of unripe tomatoes coated with cornmeal and fried. Store tomatoes at room temperature or in the refrigerator. Fruits will continue to ripen after being picked if they are stored in a warm place. You can also dry large tomatoes in the sun or oven. If using an oven, warm to just below 145 degrees F until tomatoes are dried but flexible. Stored in airtight containers in a cool place, they can last up to nine months. Tomatoes make an ideal crop for the beginning seed saver as they are self-pollinating and produce seed the same season as planted. Better yet, you only need a few fruit to get started. The tomato is an annual crop. It will complete its full life cycle—including germination, reproduction, and death—in one growing season. When saving seeds from tomatoes, separate varieties by 10-50 feet. A single tomato plant can produce viable seed. To maintain a variety over time, save seeds from between 5-10 plants. Tomato seeds are mature when the fruit is ready to eat. To save seeds from tomatoes, squeeze out the pulp and seeds from the inside of the fruit into a container. Leave the container to sit for at least one day in a warm (80-90 degrees F) spot out of direct sunlight so that the pulp can ferment. This process allows the tomato seeds to separate from the gelatinous coating that covers them. Viable seed will sink to the bottom of this mixture, and dead seeds will float. When a small amount of mold begins to form on the mixture, pour off the floating solids and dead seeds and thoroughly rinse the sunken seeds in running water. (A fine mesh strainer is ideal for this step of the process.) Once thoroughly cleaned, seeds can be placed on a screen or a coffee filter and left to dry for 5-7 days. When stored in a cool, dry place, tomato seeds will remain viable for 5-10 years.